Rear Admiral (Retd.) 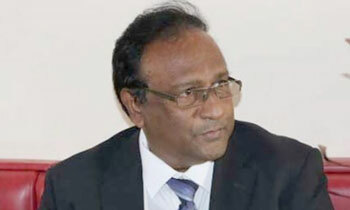 Sarath Weerasekera speaking before the UNHRC in Geneva today urged the Council to impose a moratorium on all actions related to the resolution against Sri Lanka pending a decision on his Complaint Procedures petition. “Normally, the Complaint Procedures mechanism is used against States, but I have adduced cogent reasons why the mechanism must cover complaints against the UNHRC or the OHCHR,” he said. Rear Admiral Weerasekera further said: " In March 2017, I filed two reports which conclusively rebutted the OISL report of the High Commissioner which alleged that Sri Lankan forces committed war crimes. The OISL report is the basis for resolution 30/1. The SL Government's Foreign Minister co-sponsored the resolution without the approval of the President and the Parliament of Sri Lanka. Having exhausted all my options in bringing this situation to the attention of the Council, I have filed a Complaint Procedures petition. I request the Council to impose a moratorium on all actions related to resolution 30/1 pending a decision on my complaint."